WELLINGTON, New Zealand, May 17, 2012 (ENS) – One of New Zealand’s major environmental groups will appeal a decision by the Environment Court that stops climate change impacts from being considered under the Resource Management Act. The Royal Forest & Bird Protection Society of New Zealand says its appeal will be heard in the High Court. If the group’s appeal is successful, it would mean that the contribution to climate change of developments such as coal mining would be considered during the government’s permitting process, known as the resource consent process. The Environment Court decided May 1 it would not consider climate change caused by burning coal overseas that is mined in New Zealand. The decision applies to the open-cast coal mine that Bathurst Resources plans for the Denniston Plateau on the west coast of New Zealand’s South Island. 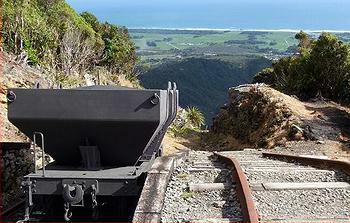 The Australian mining company has resource consent from the New Zealand government to develop the Denniston coal mine – a mine on public conservation land that Forest & Bird, and others, have been campaigning against for years. Speaking on behalf of Forest & Bird, Debs Martin says the organization believes the Resource Management Act should not ignore the negative effects of climate change. Pure Advantage, a group of New Zealand business people promoting green growth for greater wealth, has joined environmental groups in questioning Conservation Minister Kate Wilkinson’s decision to shut out public consultation over the Bathurst Resources mine. Bathurst Resources proposes to mine 6.1 million tonnes of coal from the Dennison Plateau and then an additional 80 million tonnes from the area over a 35 year period. During the early years of the 20th century there was a large coal mine close to the town of Denniston, now little more than a ghost town. Coal is still mined on the Plateau at the nearby Burnett’s Face and at the Stockton Mine. Bathurst would pay royalties to New Zealand, employ hundreds of people, and bolster the region’s economy. But opponents say the mining would destroy a unique habitat and contribute to global warming. 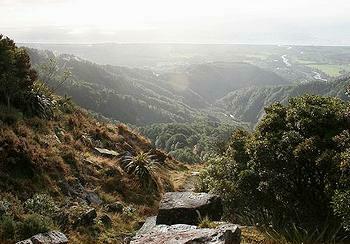 “As New Zealand’s voice for nature Forest & Bird has to seek clarification of the law,” Martin said. Forest & Bird considers that climate change regulation under the Kyoto Protocol is inadequate on its own. Forest & Bird is seeking a 5,900 hectare (22.7 square mile) reserve on the Denniston Plateau to protect it from open-cast mining and give future generations the opportunity to make their own decisions regarding mining and burning coal. On May 8, around 50 members of environmental groups: Forest & Bird, Coal Action Network Aotearoa, Ora Taiao, 350.org, Generation Zero and the Aotearoa Is Not For Sale Hikoi gathered in at Lambton Quay, Wellington to call for the government to put a freeze on coal development.